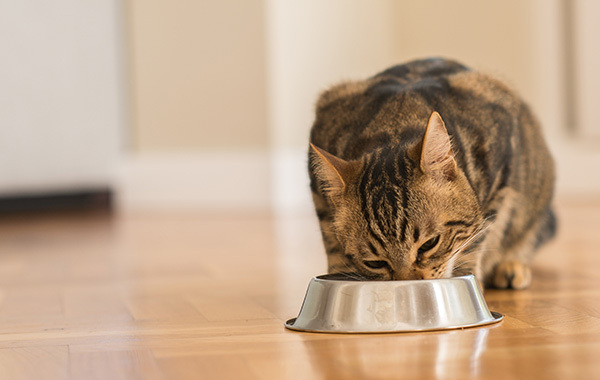 Is your cat always truly hungry or do you think your cat is always hungry? Unfortunately, many owners do not understand cats’ language, and they commonly misinterpret the loud miaowing and rubbing in the kitchen as a sign of hunger. Cats very quickly learn that if they follow us to the kitchen and start vocalising, we will give them food or treats. Many of these cats are not hungry but simply greedy or bored, and they get rewarded for their behaviour with a tasty snack; therefore, they repeat the behaviour continuously. Let’s not forget that some cats are very motivated by food. Some people mention worms when their cat asks for more food, but there is no good evidence published to support this. On the other hand, some cats will truly always be hungry. In these cases, we must examine the cat, the type of food, and frequency of feeding, as well as their nutritional requirements. Some cats are underfed — the diet is of poor nutritional value, or the incorrect amount is being fed and, therefore, the cat is asking for more. This can be easily assessed; if in doubt, speak to your vet. Some diseases will present themselves as an increase in appetite. Two of the most common ones will be hyperthyroidism and diabetes mellitus. In both cases, the cat will ask for food constantly and then will devour it. Commonly, they will lose excessive amounts of body weight, despite eating large amounts. Let’s not forget about the cases when a cat asks for food but then refuses to eat it. Sometimes we blame it on fussiness, but we should always rule out any underlying problems, like dental disease. Ultimately, there are many reasons why cats continuously ask for food. Discuss it with a vet at the earliest opportunity to make sure that there is nothing sinister occurring.